Copper Beech teachers, staff and guests recently gathered for a retreat on diversity and inclusion with Master Teacher Leslie Booker. Copper Beech Institute is committed to providing a safe, welcoming environment where all people can find a refuge and community for cultivating mindfulness, compassion and well-being. But like other retreat centers around the country, attendance at our programs is largely lacking in diversity — despite the vision we hold and all our best intentions. The Copper Beech Diversity and Inclusion Committee is on a mission to change that. Newly formed in early 2018, the Diversity Committee comprises six board members and an intern, four of whom are people of color or of Asian or Middle Eastern heritage. In its three bimonthly meetings to date, the committee has defined its objectives and is currently formulating an action plan for realizing those objectives. In contemplating these questions, the committee has identified three primary initiatives. First, to increase the diversity of attendees, the committee has identified the need to increase the diversity and representation of teachers and to broaden the themes of the programs being offered. The goal in so doing is to more inclusively and effectively engage with individuals from diverse backgrounds, such as people of color or those within the LGBTQ community. Second, to help inform the content offered, the committee is seeking to engage with our external partners that represent or serve diverse, disenfranchised, and under-resourced communities, including the schools, correctional centers, and social service and related facilities to which Copper Beech brings the teaching of mindfulness. The insight gained through these conversations can help us tailor what is offered externally, and also help shape the programs offered in-house, Vamsi says. Third, the committee has identified ongoing training in diversity and cultural humility as an essential requirement for teachers, staff and the board. “Internally, we need to bring the issues to light,” Vamsi says. This means cultivating greater awareness and knowledge of different races, cultures and orientations, and skills for navigating the dynamics of those differences. It also means becoming sensitive to the complex issues of racism, power, and privilege that are woven into our society, the trauma that marginalized communities commonly suffer, and how each of us contribute. “This is an ongoing process — an ongoing effort to raise awareness that’s up to each of us individually,” Vamsi says. The Diversity Committee is in the early stages of acting upon these objectives, and we anticipate seeing the fruits of its work in Copper Beech programming as well as related diversity initiatives in the coming months. One early idea Vamsi is keen on introducing is a bimonthly public forum where people can share about diversity in a welcoming and safe environment. Ultimately, Vamsi’s hope is to raise awareness of diversity, and to continue to improve inclusiveness for those who come to Copper Beech. 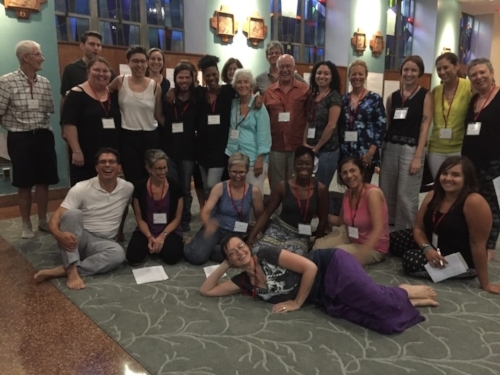 “Mindfulness, diversity and inclusivity enable us to connect with one another with deeper compassion, and more truly experience the sense of interconnectedness with people who don’t resemble us,” Vamsi says. And that mission is perfectly aligned with the vision of Copper Beech Institute.